Bristol has been named as the fifth best UK regional city for digital careers, in a survey that took into account factors ranging from the strength of the digital economy and average salaries to the price of a pint. 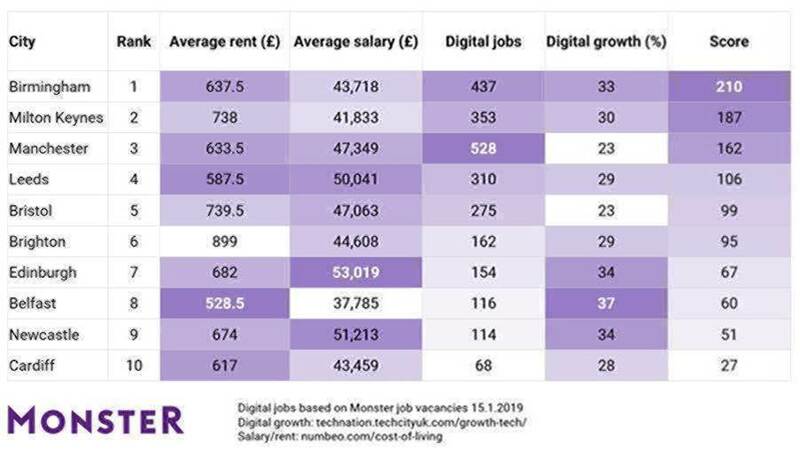 The Digital Cities Ranking, compiled by recruitment group Monster.co.uk, highlights the top 10 cities outside London for developing digital careers. Monster analysed the digital economy of each city, available digital jobs and quality of life to create an overall score. Birmingham topped the list thanks to the availability of 437 digital jobs, combined with 33% year-on-year growth. It has average salaries of over £43,000 alongside the average cost of £638 to rent a one-bed home and £4 for a pint. While Bristol benefits from higher wages (£47,063), it had fewer available jobs than Birmingham (275), earning it fifth spot on the UK wide ranking. Other cities on the list include Edinburgh, seventh in the ranking and with the highest average wages (£53,019), and eighth place Belfast, which had the lowest rents (£528.50) combined with the largest digital growth with 37%. University of Bristol pro vice-chancellor Prof Nishan Canagarajah said Bristol’s position in the table recognised the city’s digital credentials. “Channel 4’s recent decision to home one of its creative regional hubs here further shows that it’s the place to be when it comes to innovation and opportunity,” he said. “There is a wealth of scientific talent at the university developing the latest in digital technology collaboration with partners in the city.